Cumin powder : 1 tbsp. Take the cumin seeds in a pan and dry roast on low flame for a minute or less till they turn slightly brown. Don’t burn. Cool and grind in coffee grinder. Use 1 tbsp. Cut the fruits. I had cut them early so I soaked them in 2 tbsp vinegar to avoid discoloring. Or else, the vinegar can be added later on. Blend the soaked dates, cinnamon, red chili whole, ginger and the fruits, everything in the blender to purée. In a pan, add brown sugar and the purée. Add salt and pepper and cumin powder. Cook till water is evaporated on low flame. It may take from 1/2 hr to 1 hr, depending upon the water content of the fruit. Cool the chutney and store in air tight jar in the fridge . Enjoy with crackers, on sandwiches, on toasted crostinis, as a dip with cream cheese for your more fancy party crackers and pretzels. It is Autumn.. It is orange… It is red… It is yellow.. It is just the most divine season for me.. The crisp of air and the beautiful apples, pears and pumpkins in the market…with a hint of cinnamon flavors, burst from everywhere. I am kind of crazy when I go grocery shopping. My cart is filled with lots of fresh produce including vegetables and fruits, which after all are not completely consumed because of abundance. They become mushy and soft and in a state not to be eaten raw. I didn’t want to throw my apples and one pear that was in the mushy gushy state. 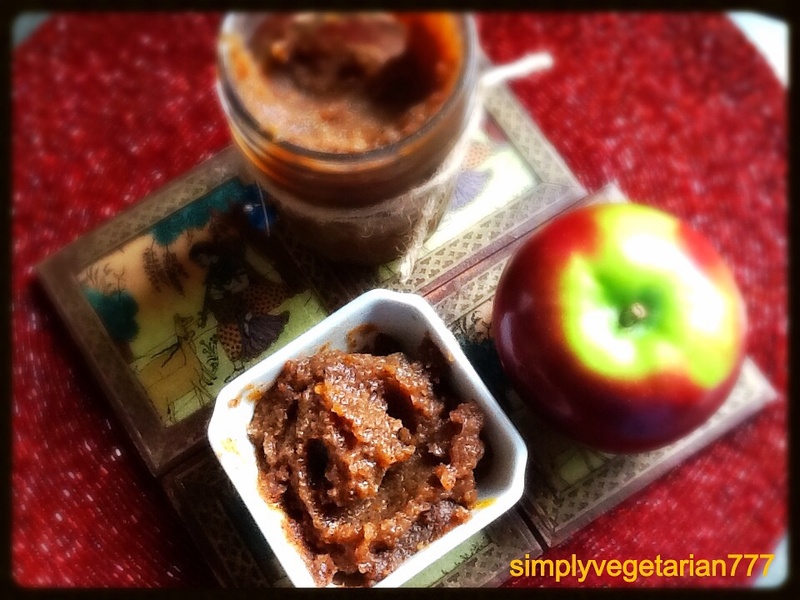 So this is what I made…beautiful golden gorgeous fruit chutney or compote which is spicy and sweet and what a great way to use the fruits.